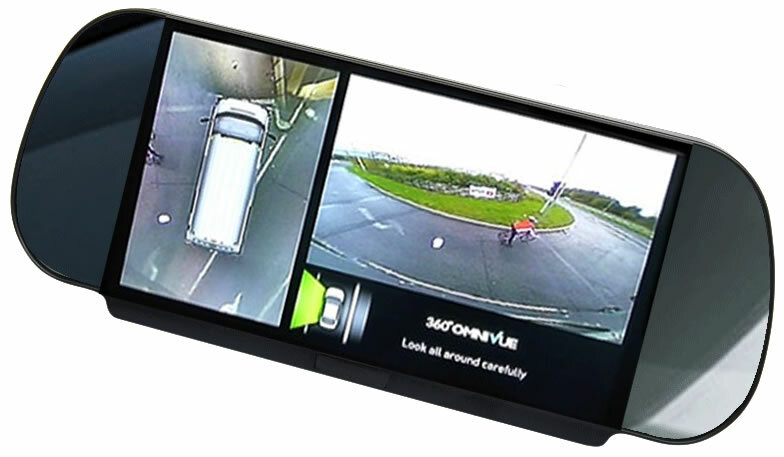 Omni-Vue™ 'HD' utilises 4 ultra-wide-angle cameras, 1 located on each side of the vehicle. The cameras connect to an Electronic Control Unit (ECU). The ECU 'stitches/blends' the images together and produces the 'look-down' view. The 'void' in the middle of the screen, the vehicle, is overlaid with a suitable vehicle graphic to give the impression that you are 'looking down' at the vehicle. Is there a camera located above the vehicle? What are the benefits of Omni-Vue™ 'HD'? No blind-spots. 360˚ visibility around the vehicle. Reversing, parking and manoeuvring in difficult locations is safe and easy. Optional 'accident recorder'/DVR to record any incidents ('crash for cash') or accidents, potentially reducing insurance premiums. Can Omni-Vue™ 'HD' be self-installed? Yes, although installation can be difficult, as panels need to be removed to 'run' the camera cables. Additionally, the system is calibrated to the vehicle and this requires specialist calibration equipment (we can 'loan' the Calibration Kit, to enable us to complete the calibration via email). Can each camera be viewed separately? Yes, individual camera views, displayed in the RH window, can be triggered automatically i.e. rear camera when reversing &/or manually selected. Where can I purchase Omni-Vue™ 'HD'? Please use the 'Contact Us' box and we will contact you with details. Can we become an agent/installer for Omni-Vue™ 'HD'? Yes, if your company has suitable facilities and experience, please 'Contact Us' for further details. What type of vehicle can utilise Omni-Vue™ 'HD'? Omni-Vue™ 'HD' is suitable for all vehicle applications. For 12V only applications please see Omni-Van™. For Plant and machines please see Omni-Plant™.